The Space Oddity who went from music to acting and back to music! David BowieI’m talking about David Bowie. He was born David Robert Jones on the 8th January 1947 in London to Margaret Mary Burns (Peggy) and Haywood Stenton Jones (John). Peggy worked as a cinema usherette and John was a promotions officer for Barnardo’s. He took up the saxophone at 13, and when he left Bromley Technical High School to work as a commercial artist three years later, he had started playing in various bands - the Konrads, the King Bees, David Jones and the Buzz. Three of David’s early bands — the King Bees, the Manish Boys (featuring session guitarist Jimmy Page), and Davey Jones and the Lower Third — each recorded a single. He changed his name to David Bowie (after a friend permanently paralysed his left pupil in a knife fight) to avoid confusion with the Monkees' Davy Jones. In 1966, when he was 19, he recorded three singles for Pye Records. The following year he signed with Deram Records, issuing several singles and The World of David Bowie (most of the songs from that album, and others from that time were collected on Images 1966-67). Then he went out on his own. But after recording an unsuccessful solo album, David left the music world for about two years. This period was to be a mirror image of the rest of his life, which proved to be incredibly experimental for the young artist. For several weeks in 1967 he lived at a Buddhist monastery in Scotland, and in 1968 he started his own mime troupe called Feathers. Around this time he also met the American-born Angela Barnett. They married on the 20th March 1970, had one son together called Zowie in 1971 and divorced in 1980. Early in 1969, he returned to music. He signed a deal with Mercury Records and that summer released the single "Space Oddity." David said the song came to him after seeing Stanley Kubrick's 2001: A Space Odyssey. "I went stoned out of my mind to see the movie and it really freaked me out, especially the trip passage." The song quickly appealed to the public because the BBC used it during its coverage of the Apollo 11 moon landing. Later the song enjoyed success in the U.S., when it was released in 1972 and climbed to Number 15 on the charts. The Man Who Sold the World was his next album and it further shot him to stardom. The album gave up a heavier rock sound than anything David had done before and included the song "All the Madmen," about his institutionalised brother, Terry. 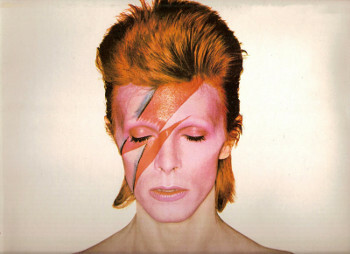 In addition the album also featured two hits: "Hunky Dory," a tribute to Andy Warhol and Bob Dylan; and "Changes," which came to symbolise David himself. This album hit number 58 in the All Time 1000 Albums list. In 1972 he released “The Rise and Fall of Ziggy Stardust and the Spiders from Mars," a concept album about a space-age rock star. This album was followed by others in a similar tone. Rock albums built around a central character and concerned with futuristic themes of Armageddon, gender dysfunction, confusion, as well as more contemporary themes such as the destructiveness of success and fame, and the dangers inherent in star worship. But just as quickly as David transformed himself into Stardust, he changed again. He leveraged his celebrity and produced albums for Lou Reed and Iggy Pop. In 1973 he disbanded the Spiders, shelved Stardust and announced he was finished with live shows. In the mid 1970s, David was a heavy drug addict on cocaine and heroin. In 1975, he changed direction and underwent a full-scale makeover. Gone were the outrageous costumes and garish sets. Musically, he released “David Live” and "Young Americans," a soul (or plastic soul as he later referred to it) album. This produced his first number one hit in the US, "Fame." In 1976, he also appeared in his first major film, The Man Who Fell to Earth. With his different-coloured eyes (both were blue, but one was permanently dilated due to the fight) and skeletal frame, he looked the part of an alien. The following year, he released "Station to Station," containing some of the material he had written for the soundtrack to this film (which was not used). As his drug problem intensified, his behaviour became more erratic. Reports of his insanity started to appear, and he continued to waste away physically. He ran away to Europe, finally settling in Berlin, where he changed musical direction again and recorded three of the most influential albums of all time, an electronic trilogy with Brian Eno "Low, Heroes and Lodger." Towards the end of the 1970s, he finally kicked his drug habit, and recorded the album many of his fans consider his best, the Japanese-influenced "Scary Monsters." Around this time, he played the Elephant Man on Broadway, to considerable acclaim. Over the next few years his acting career took off while his musical career dropped off. This finished with his much-admired performance in Merry Christmas Mr. Lawrence in 1983. In 1983, with a new contract with RCA, he recorded "Let's Dance," an album which proved an unexpected huge commercial success, and produced his second number 1 hit single in the US. The tour which followed, "Serious Moonlight," was his most successful ever. Faced with this success on a massive scale, David apparently attempted to repeat the formula in the next two albums. This was less successful and even got critical scorn. He turned down the role of Max Zorin for the 1985 James Bond film A View to a Kill quoting his lack of enthusiasm for recent Bond villains. And in 1991 he turned down the role of Captain Hook in Hook. Finally, in the late 1980s, he decided that he didn’t want commercial success or a solo career and formed the hard rock band, Tin Machine, who had a deliberate limited appeal. By now, his acting career was in decline. After the comparative failure of Labyrinth in1986, the movie industry appeared to have decided that David was not a sufficient name to be a lead actor in a major movie, and since that date, most of his roles have been cameos or glorified cameos. He himself also seems to have lost interest in movie acting. Tin Machine toured extensively and released two albums, with little critical or commercial success. Over the next decade, David moved back and forth between acting and music, with music getting less attention. Outside of a couple of modest hits, David’s musical career weakened. The albums Tin Machine (1989) and Tin Machine II (1991) proved to be flops, while his much-hyped album Black Tie White Noise (1993), which David described as a wedding gift to his new wife, supermodel Iman Abdulmajid, also struggled to resonate with record buyers. The 1990s have been kinder to David than the late 1980s. He released three albums to considerable critical acclaim and reasonable commercial success. In 1995, he renewed his working relationship with Brian Eno to record "Outside." After an initial hostile reaction from the critics, this album has now taken its place with his classic albums. Having completed a world tour in 1997, David Bowie proved himself to be a true music industry survivor. In 1999, he recorded a duet with Brian Molko on the Placebo track 'Without You I'm Nothing' before he returned back to the studio to record an album. Oddly enough, the most popular David Bowie creation of late has been Bowie Bonds, financial securities that he himself backed with royalties from his pre-1990 work. He issued the bonds in 1997 and earned $55 million from the sale. The rights to his back catalogue were returned to him when the bonds matured in 2007. In 2003, David released an album entitled 'Reality.' The Reality Tour began in November 2003 and, after great commercial success, was extended into July 2004. He was performing in Oslo when a lollipop hit him in the eye and a week later he suffered chest pains. In June 2004 he got a major health scare when he suffered a heart attack while onstage in Germany and underwent triple heart bypass surgery. The tour ended when he cancelled the last 15 dates of the tour. He gave up his 50 cigarettes a day smoking habit and made a full recovery. He went on to work with bands such as Arcade Fire and with the actress Scarlett Johansson on her album Anywhere I Lay My Head (2008), a collection of Tom Waits covers. The reality tour was his last tour to date. .
After recovering, David did not release any new music and little acting. In 2006, he played Tesla in The Prestige (2006) and had a small cameo in the series "Extras" (2005). In 2007, he did a cartoon voice in "SpongeBob SquarePants" (1999) playing Lord Royal Highness. He has not appeared in anything since 2008 and stays home in New York with his wife and daughter. David Bowie, who was inducted into the Rock and Roll Hall of Fame in 1996, was a 2006 recipient of the Grammy Lifetime Achievement Award. He has performed with (on separate occasions)- Queen, Mick Jagger, Iggy Pop, Al B. Sure!, Tina Turner, Annie Lennox, Nine Inch Nails and Bing Crosby. He appeared in Bing Crosby’s last TV show before his death in 1977 when they sang a duet of “The Little Drummer Boy”. The Sunday Times list estimated his net worth at $164 million in 2009.